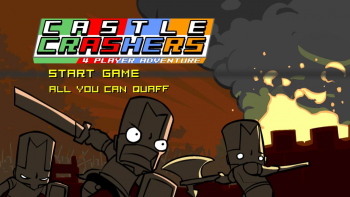 The Steam version of Castle Crashers will feature Steam achievements, voice chat and local multiplayer. I had no idea the folks at Behemoth were poetically inclined, but its announcement came in a bit of doggerel from Behemoth forum moderator Dan Paladin: "While BattleBlock has been churning / there's another wheel turning! / And that wheel is Castle Crashers running on Steam!" Yes, the little maniacs with the big heads who've rescued 1,524,612 princesses so far - royalty must breed like rabbits in their world - will now come to PC gamers, complete with features like voice chat, Steam achievements and local as well as online multiplayer. The announcement came at GamesCom, and for those of you who happen to be in the vicinity who want a word with the Behemoth team, John Baez will be in GamesCom Hall 7.1 booth C030 from August 17th - 19th. The gameplay is blessedly simple. Your knights - there's a small township's worth of playable characters, though you start with four and unlock the rest - maraud across the landscape, beating up everything in sight that isn't them or a princess, thus saving the day. The Steam version will feature 30 levels and 5 arena modes, with over 25 unlockable characters for players to discover. It doesn't look as though it will put much strain on your system or sound card, but those wanting to know more about its tech specs should go here. Alas, there is no release date yet. However there will be a playable demo version at Pax Prime; see the Behemoth Booth #3003 if you happen to be headed that way. Let the last word be said by Paladin, Poet Laureate: "It was accomplished by utilizing one of our programming teams! / We always liked this platform so it's kind of a dream!"